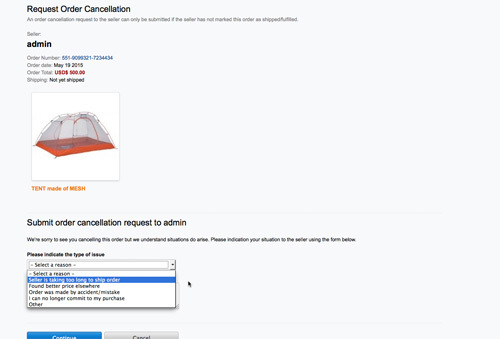 In the case that an order needs to be cancelled, the buyer would click the request order cancellation button from the buying activity purchases tab. Buyers can only cancel an order if seller has NOT marked as shipped and fulfilled. Buyer can then review the Cancels tab, this will show up as a prominent background colour explaining the action being performed between the users. The buyer has a ONE LAST ATTEMPT to cancel his/her order cancel request before the seller marks as “Cancelled” for good. Since no item quantity has been deducted from the sellers’ items for the order, the items are released/still visible within the marketplace for other buyers to complete purchase. Once a payment has been made for the order the quantity deductions will occur for ordered items. A finalized “Cancelled Order” would appear in the same area “Cancels” and the “comment” would be shown to the buyer why the seller ultimately cancelled the order.